1277. Franklin "Frank" SEIWELL [scrapbook] 1, 2 (Sarah Elizabeth CLARK , Catherine BITLER , John Wolf , John , Johannes ) was born on 21 Oct 1873 in Hazleton, Luzerne Co, PA. He died on 11 Mar 1960 in Williamsport, Lycoming Co, PA. He was buried on 14 Mar 1960 in Wildwood Cemetery, Williamsport, Lycoming Co, PA.
Frank resided in 1900 in 588 N East Side Vine St, Hazleton, Luzerne Co, PA. He worked as Railroad Conductor in 1900. He resided in 1910 in 610 Vine St, Hazleton, Luzerne Co, PA. He worked as Conductor - Railway in 1910. He resided in 1920 in 2526 Grand St, Williamsport, Lycoming Co, PA. He resided in 1930 in 918 Poplar St, Williamsport, Lycoming Co, PA. He worked as janitor - novelty shop in 1930. He resided in 1940 in 2605 Fourth St, Williamsport, Lycoming Co, PA. He worked as janitor - paper company in 1940. Frank married Mary Wiley FEGAN [scrapbook], daughter of Christopher FEGAN and Jane/Jean FRANK / CRAIG, about 1893. 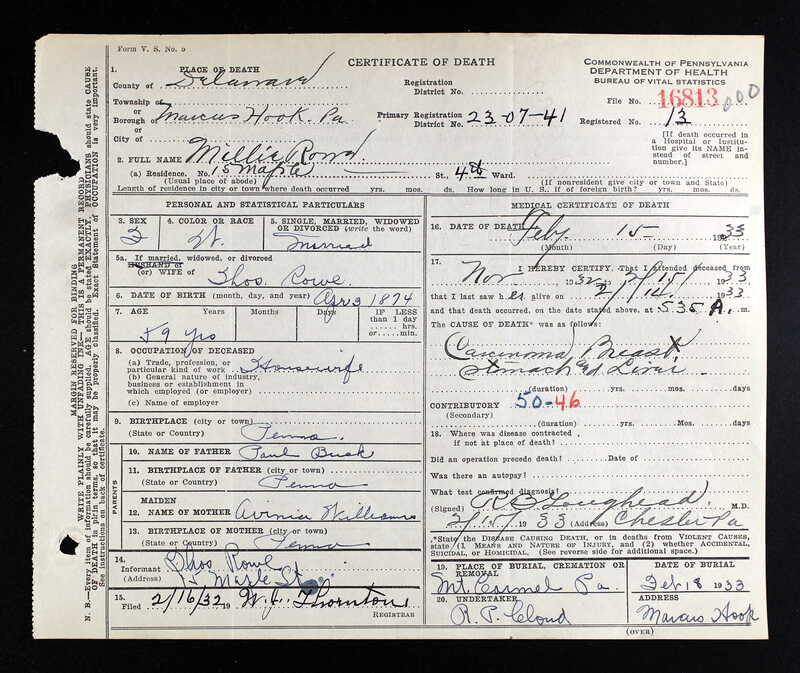 Mary was born on 9 Sep 1869 in Hazleton, Luzerne Co, PA. She died on 17 Apr 1945 in Williamsport, Lycoming Co, PA. She was buried on 19 Apr 1945 in Mound (Wildwood) Cemetery, Williamsport, Lycoming Co, PA.
Mary resided in 1880 in Hazleton, Luzerne Co, PA. She worked as At School in 1880. She resided in 1900 in 588 N East Side Vine St, Hazleton, Luzerne Co, PA. She resided in 1910 in 610 Vine St, Hazleton, Luzerne Co, PA. She resided in 1920 in 2526 Grand St, Williamsport, Lycoming Co, PA. She resided in 1930 in 918 Poplar St, Williamsport, Lycoming Co, PA. She resided in 1940 in 2605 Fourth St, Williamsport, Lycoming Co, PA. She resided in 1945 in 2605 W Fourth St, Williamsport, Lycoming Co, PA. She worked as housewife in 1945. + 3861 F i Jean E SEIWELL was born in Jul 1894. 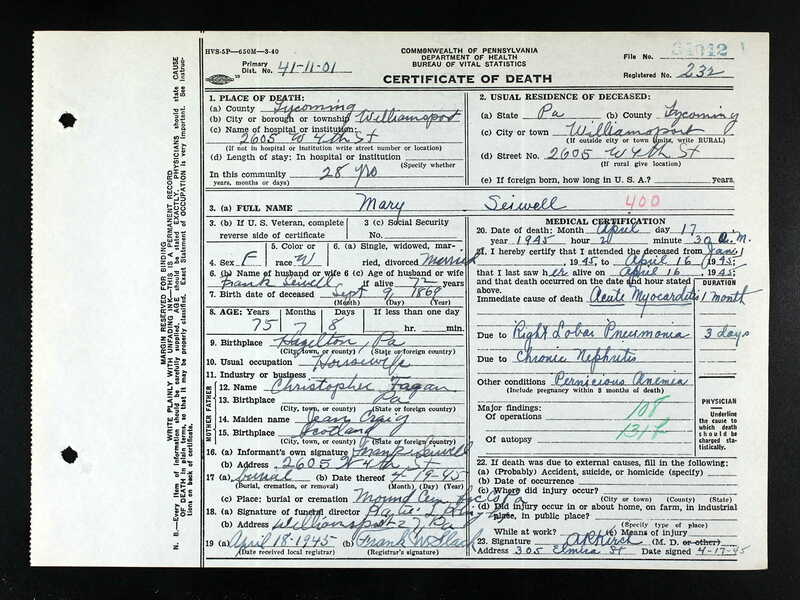 + 3862 F ii Margaret C SEIWELL was born in Jun 1898. Mary SEIWELL was born about 1901 in PA.
Mary resided in 1910 in 610 Vine St, Hazleton, Luzerne Co, PA. She resided in 1920 in 2526 Grand St, Williamsport, Lycoming Co, PA.
Grace S SEIWELL was born about 1903 in PA.
Grace resided in 1910 in 610 Vine St, Hazleton, Luzerne Co, PA. She resided in 1920 in 2526 Grand St, Williamsport, Lycoming Co, PA. She resided in 1930 in 918 Poplar St, Williamsport, Lycoming Co, PA. She worked as office clerk - U.S. Rubber Works in 1930. Raymond S SEIWELL was born on 27 Sep 1912 in PA. He died on 13 Aug 2005 in Williamsport, Lycoming Co, PA (?). 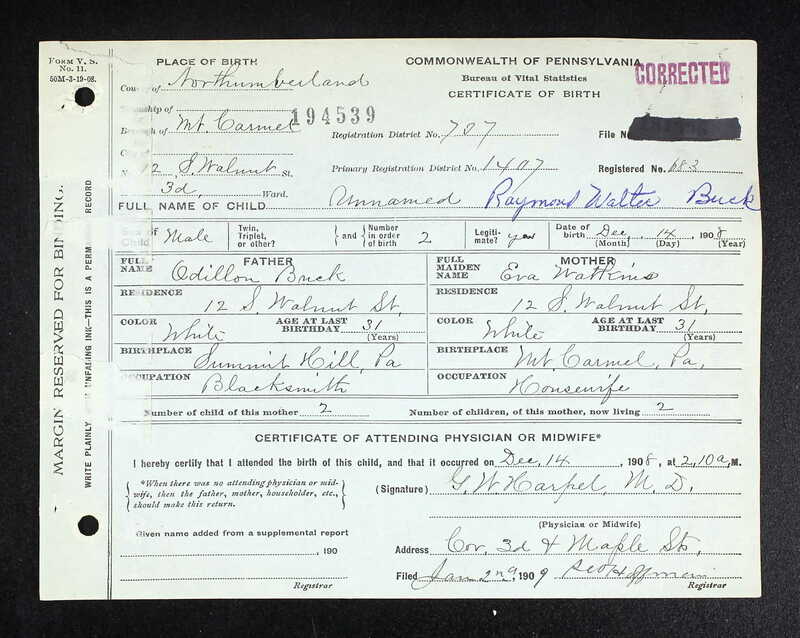 Raymond resided in 1920 in 2526 Grand St, Williamsport, Lycoming Co, PA. He resided in 1930 in 918 Poplar St, Williamsport, Lycoming Co, PA. He was issued a social security number before 1951 in CT.
1282. 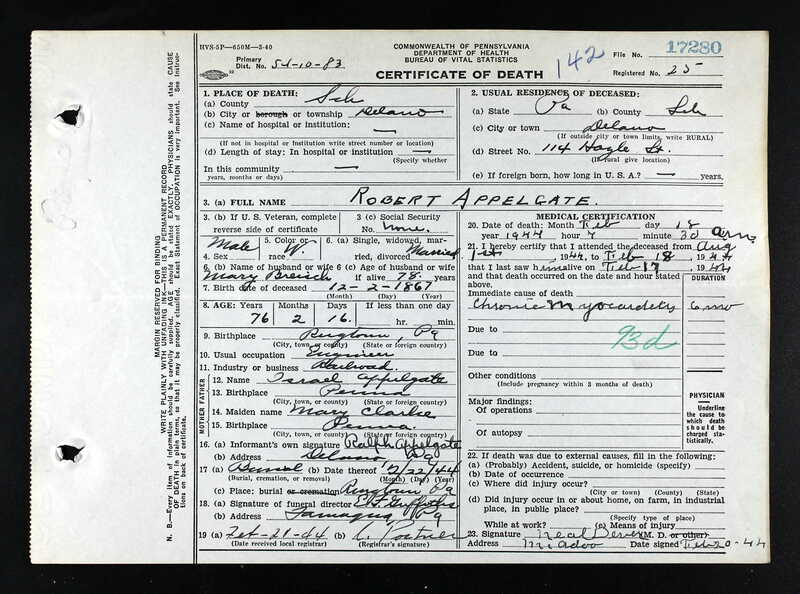 Robert Morris APPLEGATE [scrapbook] (Mary CLARK , Catherine BITLER , John Wolf , John , Johannes ) was born on 2 Dec 1867 in Ringtown, Schuylkill Co, PA. He was baptized on 9 Feb 1868. He died on 18 Feb 1944 in Delano, Schuylkill Co, PA. He was buried on 22 Feb 1944 in St. John's Cemetery, Ringtown, Schuylkill Co, PA.
Robert resided in 1870 in Union Twp, Schuylkill Co, PA. He resided in 1880 in Union Twp, Schuylkill Co, PA. He worked as laborer in 1880. He resided in 1900 in Delano, Schuylkill Co, PA. He worked as fireman - railroad in 1900. He resided in 1910 in 114 Hazle St, Delano, Schuylkill Co, PA. He worked as engineer - locomotive in 1910. He resided in 1920 in 114 Hazle St, Delano, Schuylkill Co, PA. He worked as engineer - locomotive in 1920. He resided in 1930 in 114 Quakake St, Delano, Schuylkill Co, PA. He worked as engineer with Lehigh Valley Railroad. He resided in 1935 in 114 Hazle St, Delano, Schuylkill Co, PA. He resided in 1940 in 114 Hazle St, Delano, Schuylkill Co, PA.
Robert married Mary B BREISCH "Mollie" [scrapbook], daughter of Josiah BREISCH and Susannah ZIMMERMAN, about 1893. Mollie was born in Jun 1865 in Ringtown, Schuylkill Co, PA. She died on 30 Jun 1945 in Delano, Schuylkill Co, PA. She was buried on 3 Jul 1945 in St John's Cemetery, Ringtown, Schuylkill Co, PA.
Mollie resided in 1900 in Delano, Schuylkill Co, PA. She resided in 1910 in 114 Hazle St, Delano, Schuylkill Co, PA. She resided in 1920 in 114 Hazle St, Delano, Schuylkill Co, PA. She resided in 1930 in 114 Quakake St, Delano, Schuylkill Co, PA. She resided in 1935 in 114 Hazle St, Delano, Schuylkill Co, PA. She resided in 1940 in 114 Hazle St, Delano, Schuylkill Co, PA.
+ 3866 F i Jennie M APPLEGATE was born in 24 May 1894/Jun 1895. She died on 8 May 1929. + 3867 M ii Robert Roy APPLEGATE was born on 17 Jul 1897. He died on 27 May 1989. 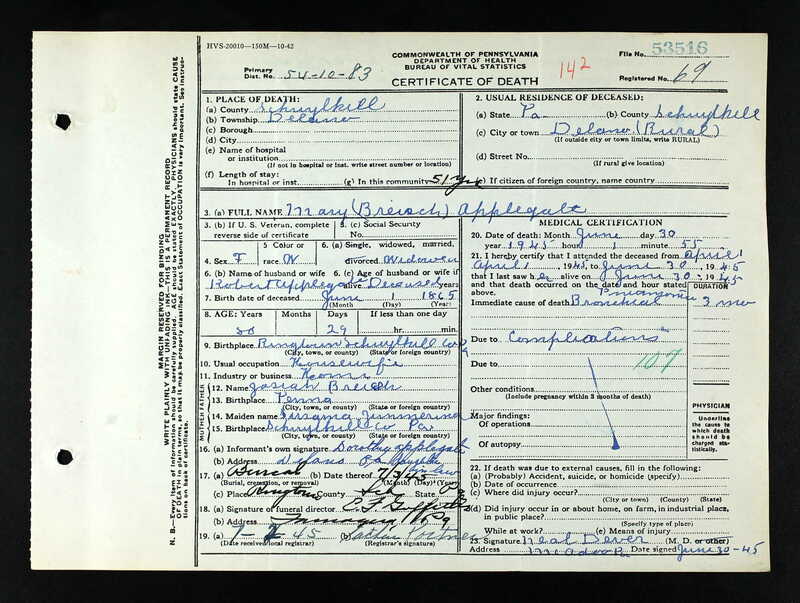 Leonard E APPLEGATE was born about 1901 in PA.
Leonard resided in 1910 in 114 Hazle St, Delano, Schuylkill Co, PA. He resided in 1920 in 114 Hazle St, Delano, Schuylkill Co, PA.
+ 3869 M iv Ralph Morris APPLEGATE was born about 1905. 1285. James Peter APPLEGATE [scrapbook] (Mary CLARK , Catherine BITLER , John Wolf , John , Johannes ) was born on 12 Mar 1873 in PA. He died on 23 Jun 1919 in Berwick, Columbia Co, PA. He was buried on 26 Jun 1919 in Mountain Grove Cemetery, Mountain Grove, Luzerne Co, PA.
James resided in 1880 in Union Twp, Schuylkill Co, PA. He resided in 1900 in Union Twp, Schuylkill Co, PA. He worked as carpenter. James married Cora Bella SMITH [scrapbook], daughter of John P SMITH and Mary C FRY, on 17 May 1897 in Schuylkill Co, PA. Cora was born on 10 Aug 1876 in Sunbury, Northumberland Co, PA. She died on 29 Jul 1908 in Black Creek Twp, Luzerne Co, PA. She was buried on 1 Aug 1908 in Mountain Grove Cemetery, Mountain Grove, Luzerne Co, PA.
Cora resided in 1900 in Union Twp, Schuylkill Co, PA.
Roland Roy APPLEGATE [scrapbook] was born on 21 Sep 1898 in PA. He died on 28 May 1928 in Luzerne Co, PA.
Roland resided in 1900 in Union Twp, Schuylkill Co, PA. 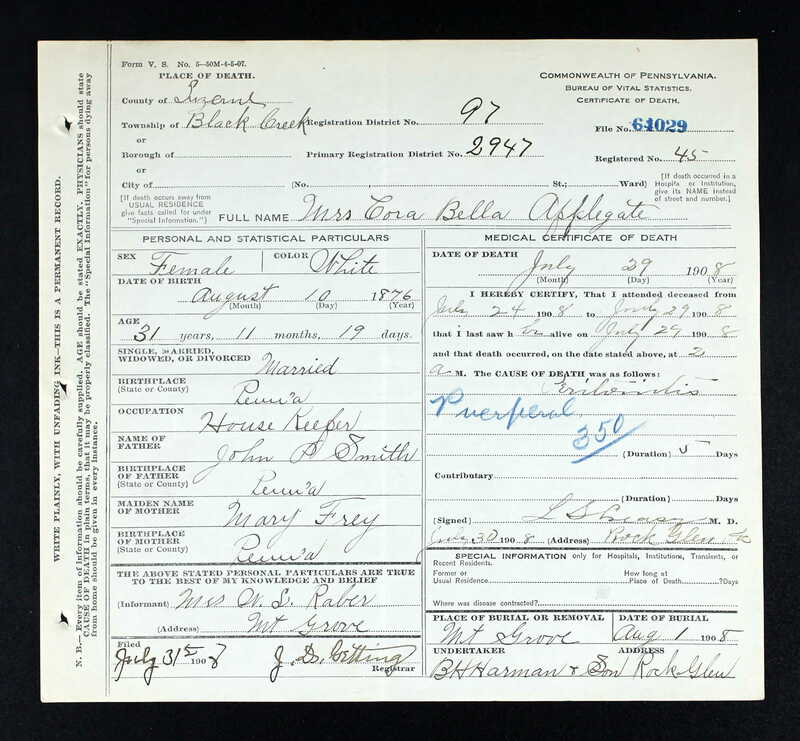 He resided in 1910 in Year: 1910; Census Place: Black Creek, Luzerne, Pennsylvania; Roll: T624_1366; Page: 6A; Enumeration District: 0007; FHL. 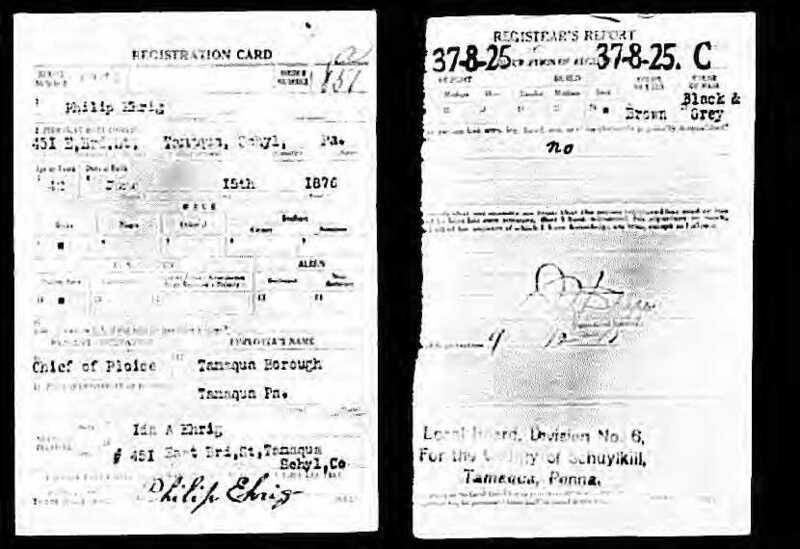 He resided in Sep 1918 in RD 1 Mainville, Columbia Co, PA. He worked as Railroad Telegraph Operator in Sep 1918. Roland married Bernice RITTENHOUSE, daughter of Miles RITTENHOUSE and Elizabeth E SHAFFER "Lizzie". Bernice was born on 10 Jan 1899 in Mountain Grove, Luzerne Co, PA. She died in Apr 1984. She was buried in Mountain Grove Cemetery, Mountain Grove, Luzerne Co, PA.
Thelma G APPLEGATE was born about 1903 in PA.
Thelma resided in 1920 in Black Creek Twp, Luzerne Co, PA.
Thelma married Frank Sylvester TROY. 1294. Millard Alfred CLARK [scrapbook] (Alfred C CLARK , Catherine BITLER , John Wolf , John , Johannes ) was born on 14 Aug 1895 in Tomhicken, Luzerne Co, PA. He died on 3 Mar 1981. He was buried in Zion Evangelical Lutheran Church Cemetery, Boalsburg, Centre Co, PA.
Millard resided in 1910 in 1261 Franklin Ave, Wilkinsburg, Allegheny Co, PA. He resided in Jun 1917 in 1007 Mill St, Wilkinsburg, Allegheny Co, PA. He worked as auto electrician (unemployed) in Jun 1917. He was issued a social security number . 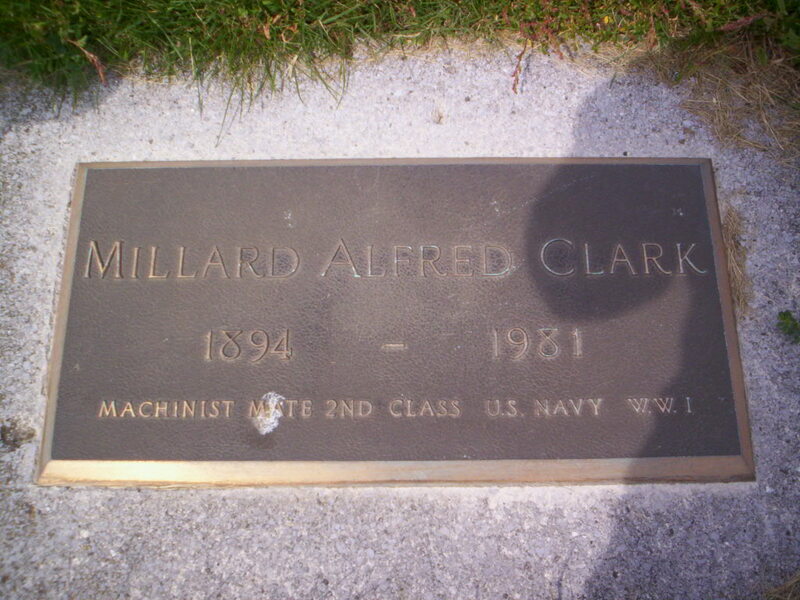 He served in the military with U.S. Navy - Machinist Mate 2nd Class from 1 Nov 1917 to 11 Mar 1919. He resided in 1920 in 1007 Mill St, Wilkinsburg, Allegheny Co, PA. He worked as clerk - ????? Co. in 1920. He resided in 1935 in Harris Twp, Centre Co, PA. 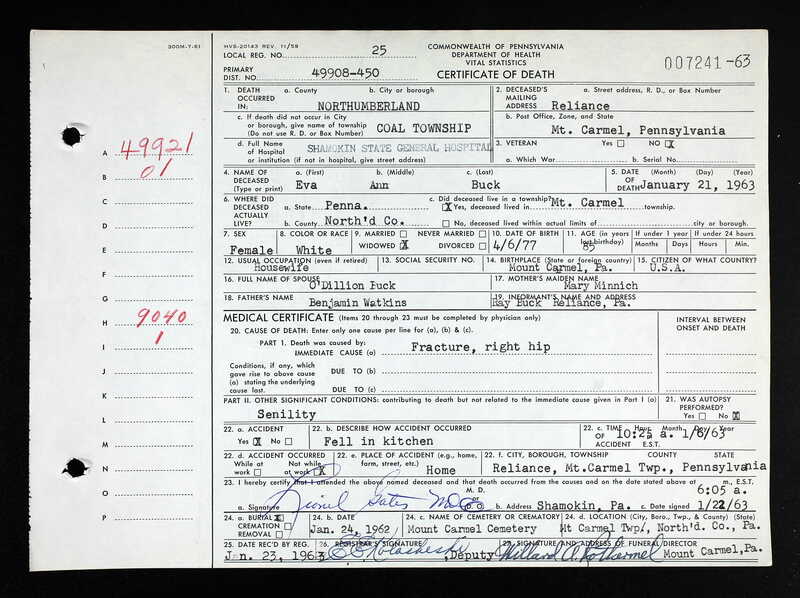 He resided in 1940 in Harris Twp, Centre Co, PA. He worked as proprietor - trucking in 1940. 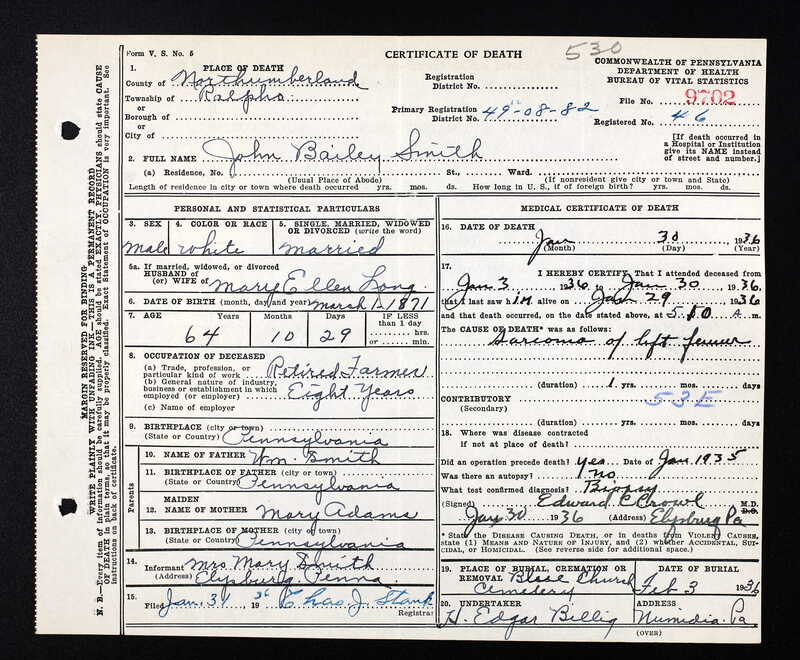 He resided in Mar 1981 in Boalsburg, Centre Co, PA.
Millard married Lillian S. Lillian was born about 1901 in PA.
Lillian resided in 1935 in Harris Twp, Centre Co, PA. She resided in 1940 in Harris Twp, Centre Co, PA.
3872 M i George M CLARK. 1295. 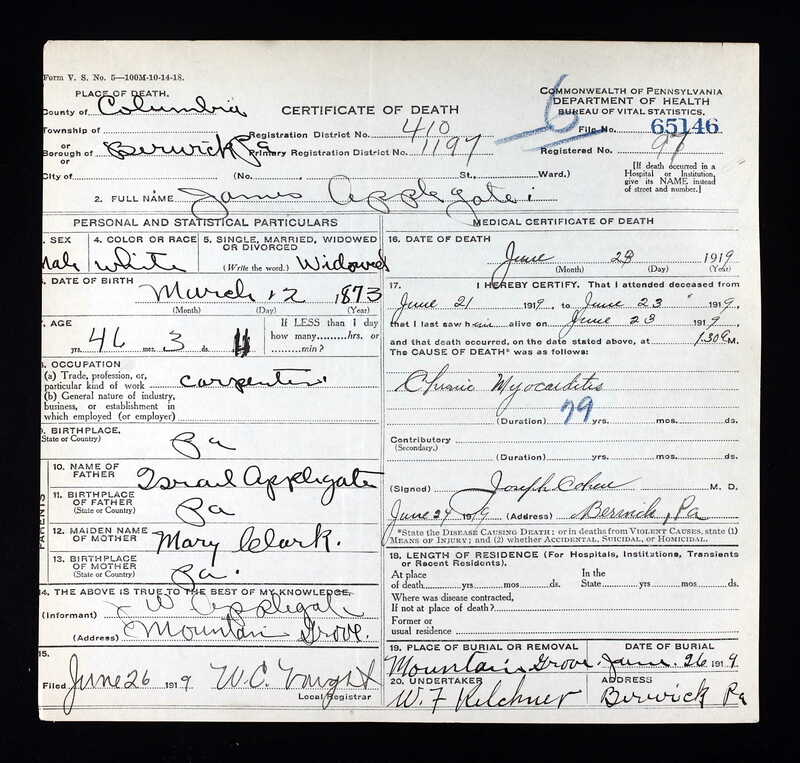 Ida Arabella SCHIRNER (Thamsen CLARK , Catherine BITLER , John Wolf , John , Johannes ) was born on 11 Aug 1881 in PA. She died on 29 May 1969 in PA. She was buried in Sky View Memorial Park, Hometown, Rush Twp, Schuylkill Co, PA.
Ida resided in 1890 in Rahn Twp, Schuylkill Co, PA. She resided in 1900 in Rahn Twp, Schuylkill Co, PA. She resided in 1910 in 417 Main St, Tamaqua, Schuylkill Co, PA. She resided in Jun 1918 in 451 E Broad St, Tamaqua, Schuylkill Co, PA. She resided in 1920 in 451 E Broad St, Tamaqua, Schuylkill Co, PA. She resided in 1930 in 451 E Broad St, Tamaqua, Schuylkill Co, PA. She resided in 1935 in 451 E Broad St, Tamaqua, Schuylkill Co, PA. She resided in 1940 in 451 E Broad St, Tamaqua, Schuylkill Co, PA.
Ida married Philip EHRIG Sr [scrapbook], son of Peter EHRIG/EHRICH and Margaret, in 1904 in Philadelphia, Philadelphia Co, PA. Philip was born on 15 Jun 1876 in Schuylkill Co, PA. He died on 13 Jan 1955 in Schuylkill Co, PA. He was buried in Sky View Memorial Park, Hometown, Rush Twp, Schuylkill Co, PA.
Philip resided in 1880 in Elm St, Tamaqua, Schuylkill Co, PA. He resided in 1900 in 216 W 3rd St, South Bethlehem, Northampton Co, PA. He worked as moulder - iron in 1900. He resided in 1910 in 417 Main St, Tamaqua, Schuylkill Co, PA. He worked as moulder - iron works in 1910. He worked as Chief of Police in Jun 1918. 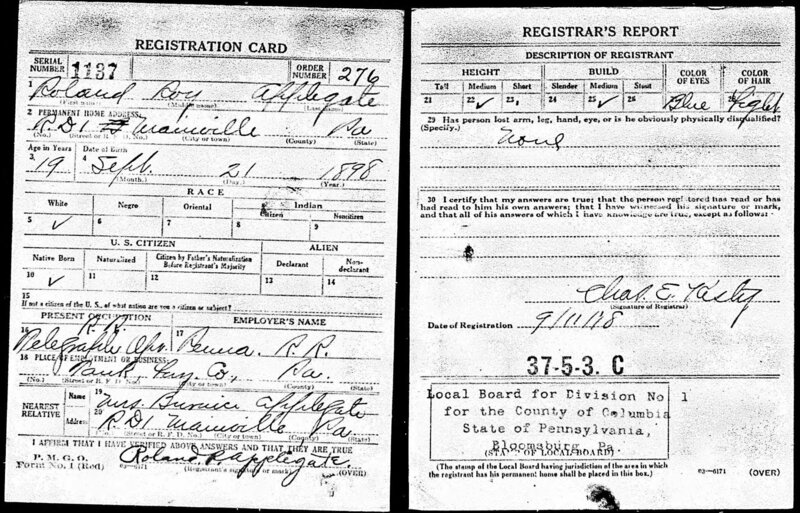 He resided in Jun 1918 in 451 E Broad St, Tamaqua, Schuylkill Co, PA. He resided in 1920 in 451 E Broad St, Tamaqua, Schuylkill Co, PA. He worked as Chief of Police in 1920 in Tamaqua, Schuylkill Co, PA. He resided in 1920 in 451 E Broad St, Tamaqua, Schuylkill Co, PA. He resided in 1930 in 451 E Broad St, Tamaqua, Schuylkill Co, PA. He resided in 1935 in 451 E Broad St, Tamaqua, Schuylkill Co, PA. He resided in 1940 in 451 E Broad St, Tamaqua, Schuylkill Co, PA. He worked as county commissioner in 1940. 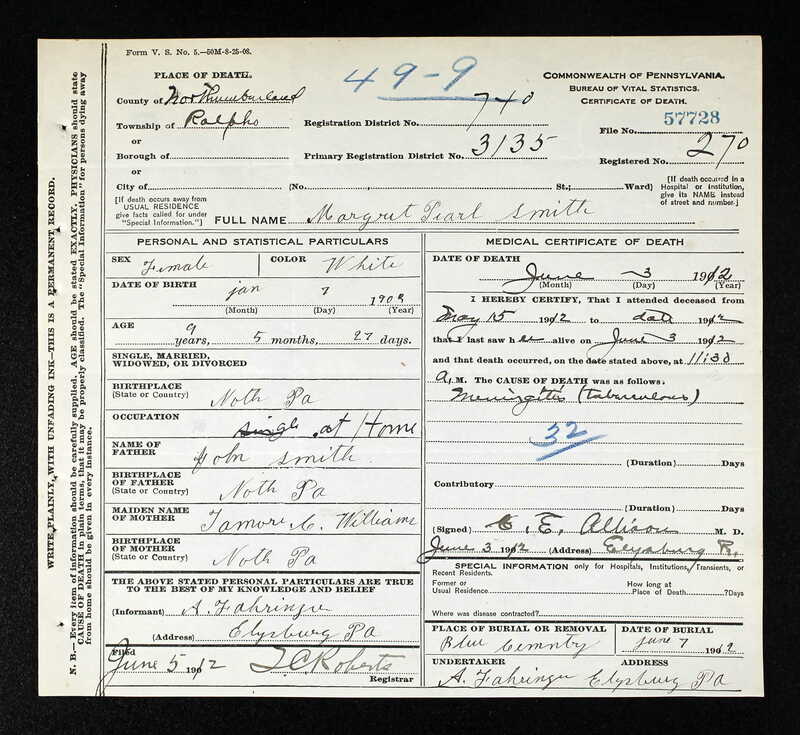 Dr Philip Frederick EHRIG [scrapbook] 1, 2 was born on 5 Nov 1904 in PA. He was baptized on 27 Nov 1904 in St John's Lutheran Church, Tamaqua, Schuylkill Co, PA. He died on 30 Mar 1968 in PA. 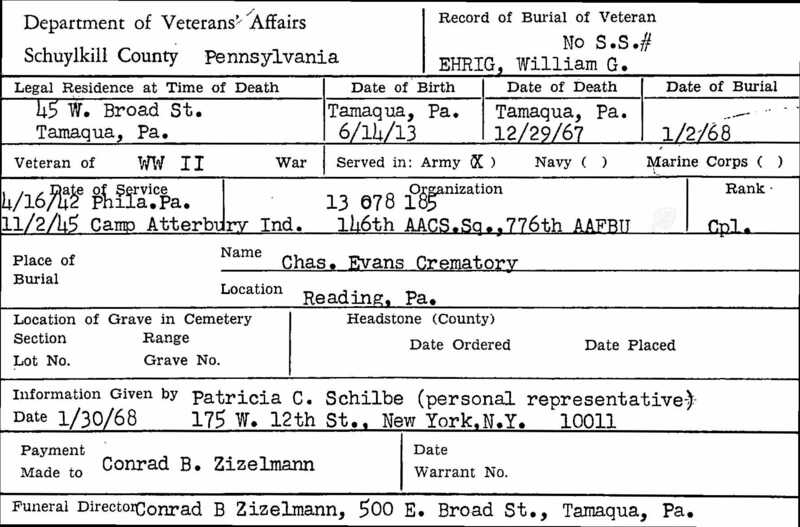 He was buried in Sky View Memorial Park, Hometown, Rush Twp, Schuylkill Co, PA.
Philip resided in 1910 in 417 Main St, Tamaqua, Schuylkill Co, PA. He resided in 1920 in 451 E Broad St, Tamaqua, Schuylkill Co, PA. He resided in 1930 in 451 E Broad St, Tamaqua, Schuylkill Co, PA. He resided in 1930 in 915 Clinton St, Philadelphia, Philadelphia Co, PA. He worked as intern - hospital (probably Philadelphia Hospital) in 1930. Philip married Nora E SHOEMAKER 1, 2, daughter of John H SHOEMAKER and Caroline ZEHNER. They had no children. Nora was born on 5 Sep 1907 in New Ringgold, Schuylkill Co, PA. She died on 14 Oct 1992 in East Stroudsburg, Monroe Co, PA. She was buried on 17 Oct 1992 in Sky View Memorial Park, Hometown, Rush Twp, Schuylkill Co, PA.
Nora graduated from Jefferson Hospital Nursing School in Philadelphia, PA. She worked as chief anesthesiologist with Philadelphia General Hospital. She worked as office manager and nurse with her husband's practice from 1933 to 1968. She resided in Jul 1992 in East Stroudsburg, Monroe Co, PA.
+ 3874 M ii Robert EHRIG was born on 26 Apr 1907. He died on 11 Sep 1960. + 3875 M iii John Peter EHRIG was born on 12 Mar 1909. He died on 6 Apr 1993. William G EHRIG [scrapbook] was born on 14 Jun 1913 in Tamaqua, Schuylkill Co, PA. He died on 29 Dec 1967 in Tamaqua, Schuylkill Co, PA. He was buried on 2 Jan 1968 in Charles Evans Cemetery, Reading, Berks Co, PA.
William resided in 1920 in 451 E Broad St, Tamaqua, Schuylkill Co, PA. He resided in 1930 in 451 E Broad St, Tamaqua, Schuylkill Co, PA. He resided in 1935 in 451 E Broad St, Tamaqua, Schuylkill Co, PA. He resided in 1940 in 451 E Broad St, Tamaqua, Schuylkill Co, PA. He worked as agent - Light Co. in 1940. He served in the military with U.S. Army - Corporal, 146th AACS Sq, 776th AAFBU from 16 Apr 1942 to 2 Nov 1945 in WW II. 1300. Tamora WILLIAMS [scrapbook] (Benneville O WILLIAMS , Tamsa BITLER , John Wolf , John , Johannes ) was born on 26 Dec 1874 in Brandonville, Schuylkill Co, PA. She died on 1 Aug 1930 in Hemlock Twp, Columbia Co, PA. She was buried on 4 Aug 1930 in Creveling Cemetery, Almedia, Columbia Co, PA.
Tamora resided in 1900 in Hemlock Twp, Columbia Co, PA. She resided in 1920 in Hemlock Twp, Columbia Co, PA. She resided in 1930 in 42 Drinker St, Fernville, Hemlock Twp, Columbia Co, PA.
Tamora married William Norman TEITSWORTH [scrapbook], son of Isaac Newton TEITSWORTH and Ruth Ann MCMURTRIE, on 16 Dec 1893 in Sunbury, Northumberland Co, PA. William was born on 16 Dec 1870 in Elysburg, Northumberland Co, PA. He died on 14 Jan 1934 in Fernville, Hemlock Twp, Columbia Co, PA. He was buried on 17 Jan 1934 in Creveling Cemetery, Almedia, Columbia Co, PA.
William resided in 1880 in Locust Twp, Columbia Co, PA. He resided in 1900 in Hemlock Twp, Columbia Co, PA. He worked as Weaver - Silk Mill in 1900. He resided in 1920 in Hemlock Twp, Columbia Co, PA. He worked as Laborer - Car Shops in 1920. He resided in 1930 in 42 Drinker St, Fernville, Hemlock Twp, Columbia Co, PA. He worked as Laborer - Carpet Mill in 1930. TEITSWORTH was born on 23 May 1894. TEITSWORTH died on 6 Jun 1894. Earl Claire TEITSWORTH was born on 23 May 1894. He died on 16 Sep 1894. 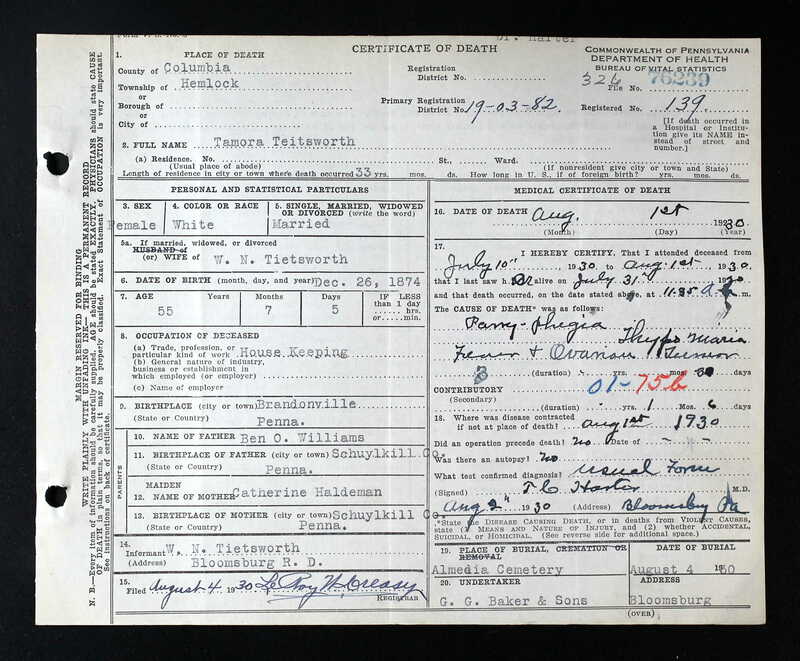 + 3879 F iii Ruth Kathryn TEITSWORTH was born on 9 Apr 1896. She died on 25 Feb 1918. 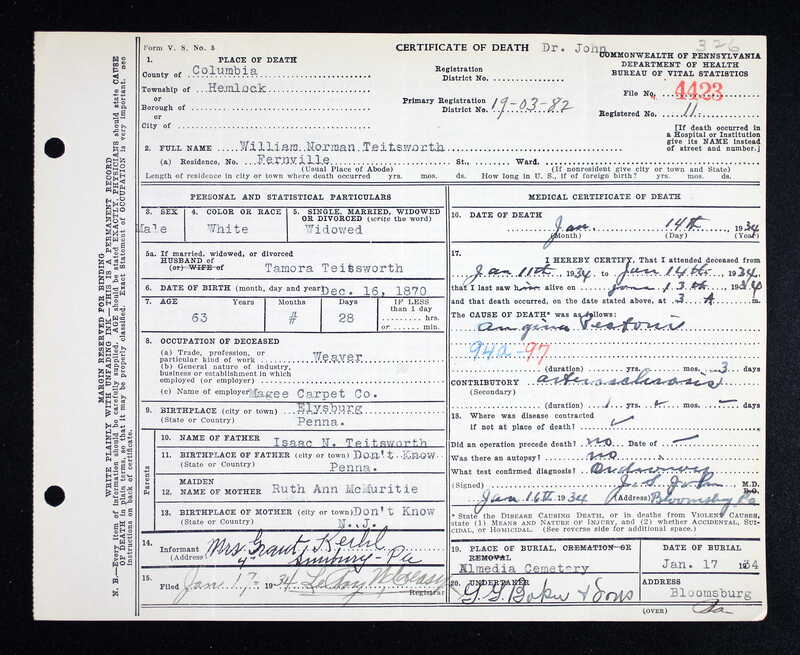 + 3880 F iv Ida Bethany TEITSWORTH was born on 1 Jan 1898. She died on 22 Feb 1914. William Newton TEITSWORTH was born on 12 Sep 1905. He died on 1 Oct 1905. Beneville Grant TEITSWORTH was born on 12 Feb 1912. He was christened 1 on 1 Jun 1912 in Wesley United Methodist Church, Bloomsburg, Columbia Co, PA. He died on 21 Feb 1987 in Bloomsburg, Columbia Co, PA.
Beneville resided in 1920 in Hemlock Twp, Columbia Co, PA. He resided in 1930 in 42 Drinker St, Fernville, Hemlock Twp, Columbia Co, PA. He was issued a social security number before 1951 in PA.
Beneville also married Madelin Grace ECK on 5 Mar 1937 in MD. Beneville also married Catherine Lenore VARNER, daughter of William A VARNER and Eliza M HOLCOMB, on 1 Sep 1948 in Sunbury, Northumberland Co, PA. Catherine was born on 29 May 1916 in Berwick, Columbia Co, PA. She died on 22 May 1995 in Bloomsburg, Columbia Co, PA. She was buried in Pine Grove Cemetery, Berwick, Columbia Co, PA.
Catherine was issued a social security number in 1959/1961 in PA. She resided in 1995 in Bloomsburg, Columbia Co, PA. She was a member of Wesley United Methodist Church, Bloomsburg, Columbia Co, PA.
1302. Obadiah BUCK [scrapbook] 1 (Lovina WILLIAMS , Tamsa BITLER , John Wolf , John , Johannes ) was born on 30 Sep 1868 in Schuylkill Co, PA. He died on 14 Jan 1934 in Bloomsburg, Columbia Co, PA. He was buried on 17 Jan 1934 in Trinity Cemetery, Numidia, Columbia Co, PA.
Obadiah resided in 1870. He resided in 1900 in Locust Twp, Columbia Co, PA. He resided in Jun 1923 in Bloomsburg, Columbia Co, PA. He resided in 1934 in Orangeville, Columbia Co, PA. He worked as shoemaker in 1934. Obadiah married Emma Margaret STOKES [scrapbook], daughter of John H STOKES and Rebecca Metz BODINE, about 1888. Emma was born on 3 May 1868 in PA. She died on 4 May 1926 in Numidia, Columbia Co, PA. She was buried on 7 May 1926 in Trinity Cemetery, Numidia, Columbia Co, PA.
Emma resided in 1870 in Locust Twp, Columbia Co, PA. She resided in 1900 in Locust Twp, Columbia Co, PA.
Bertha BUCK was born on 27 Oct 1888. She died on 11 May 1896. She was buried in Trinity Cemetery, Numidia, Columbia Co, PA.
1303. Millicent C "Amelia" BUCK [scrapbook] 1 (Lovina WILLIAMS , Tamsa BITLER , John Wolf , John , Johannes ) was born on 3 Apr 1875 in PA. She died on 15 Feb 1933 in Marcus Hook, Delaware Co, PA. She was buried on 18 Feb 1933 in Mount Carmel Cemetery, Mount Carmel, Northumberland Co, PA.
Amelia resided in 1900 in E 3rd St, Mt Carmel, Northumberland Co, PA. She resided in 1910 in 234 E 2nd St, Mount Carmel, Norhumberland Co, PA. She resided in 1920 in 45 Walnut St, Mount Carmel, Northumberland Co, PA. She worked as housekeeper in 1920. She resided in 1930 in 15 Maple St, Marcus Hook, Delaware Co, PA. She resided in Feb 1933 in 15 Maple St, Marcus Hook, Delaware Co, PA. She worked as housewife. Amelia married Thomas William ROWE [scrapbook] 1, son of David ROWE and Mary WELLINGTON, about 1904 in PA. Thomas was born on 18 Apr 1867 in Rockaway, Morris Co., NJ. He died on 4 Feb 1954 in Parkside, Delaware Co, PA. 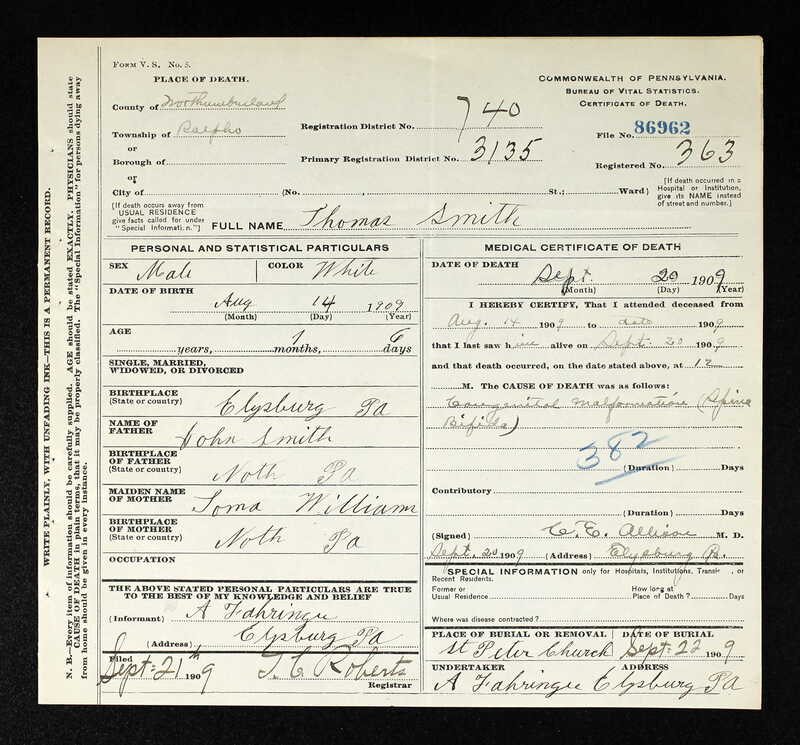 He was buried on 8 Feb 1954 in Mount Carmel Cemetery, Mount Carmel, Northumberland Co, PA.
Thomas resided in 1910 in 234 E 2nd St, Mount Carmel, Norhumberland Co, PA. He resided in 1920 in 45 Walnut St, Mount Carmel, Northumberland Co, PA. He worked as fire boss - coal mines in 1920. He resided in 1930 in 15 Maple St, Marcus Hook, Delaware Co, PA. He worked as pulp works - silk mill in 1930. 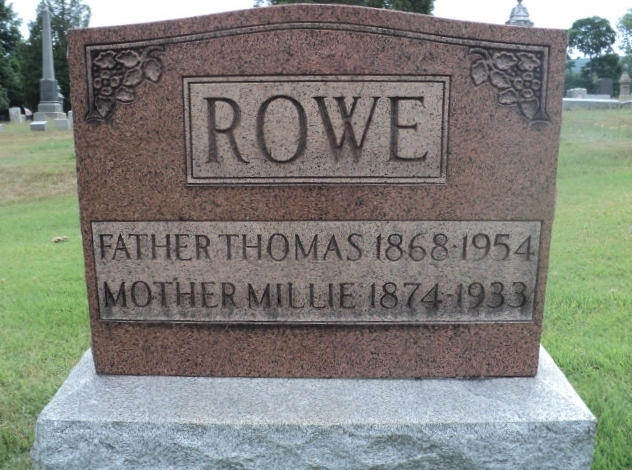 He resided in 1940 in 1225 Clover Ln, Chester, Delaware Co, PA.
George David ROWE was born about 1891 in PA.
George resided in 1910 in 234 E 2nd St, Mount Carmel, Norhumberland Co, PA.
Thomas Earl ROWE was born about 1894 in PA.
Thomas resided in 1910 in 234 E 2nd St, Mount Carmel, Norhumberland Co, PA.
Robert B ROWE 1 was born about 1897 in PA.
Robert resided in 1910 in 234 E 2nd St, Mount Carmel, Norhumberland Co, PA. He resided in 1969 in Miami, Dada Co, FL. + 3887 F iv Edna May ROWE was born about 1899. She died after 1973. William O ROWE 1 was born about 1902 in PA.
William resided in 1910 in 234 E 2nd St, Mount Carmel, Norhumberland Co, PA. He resided in 1920 in 45 Walnut St, Mount Carmel, Northumberland Co, PA. He worked as loader - coal mines in 1920. He resided in 1940 in 1225 Clover Ln, Chester, Delaware Co, PA. He worked as plumber in 1940. He resided in 1969 in Hallandale, Broward Co, FL. William married Alma A. Alma was born about 1903 in PA.
Alma resided in 1940 in 1225 Clover Ln, Chester, Delaware Co, PA.
+ 3889 M vi Arthur C ROWE was born on 22 Nov 1907. He died on 21 May 1988. + 3890 M vii John ROWE was born on 28 Mar 1909. He died on 19 Jan 1969. + 3891 M viii Paul ROWE was born on 4 Oct 1910. He died in 1978. 1304. 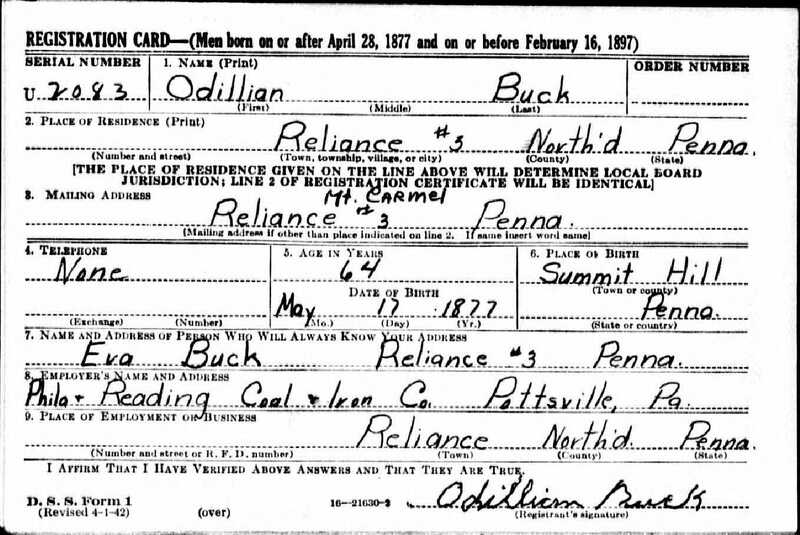 Odillian BUCK [scrapbook] 1 (Lovina WILLIAMS , Tamsa BITLER , John Wolf , John , Johannes ) was born on 17 May 1877 in Mauch Chunk/Summit Hill, Carbon Co, PA. He was baptized on 3 May 1878 in Tamaqua, Schuylkill Co, PA. He died in 1952. He was buried in Mount Carmel Cemetery, Mount Carmel, Northumberland Co, PA.
Odillian resided in 1870 in Mahanoy City, Schuylkill Co, PA. He resided in 1900 in E 3rd St, Mt Carmel, Northumberland Co, PA. He resided in 1910 in 12 Walnut St, Mount Carmel, Northumberland Co, PA. He worked as blacksmith - coal mines in 1910. He resided in 1920 in Mount Carmel Twp, Northumberland Co, PA. He worked as blacksmith in 1920. He resided in Jun 1923 in Mount Carmel, Northumberland Co, PA. He resided in 1930 in Mount Carmel Twp, Northumberland Co, PA. He worked as laborer - coal breaker in 1930. He resided in 1935 in Mount Carmel Twp, Northumberland Co, PA. He resided in 1940 in Mount Carmel Twp, Northumberland Co, PA. He resided in 1942 in RD 3 Reliance (Mount Carmel), Northumberland Co, PA. 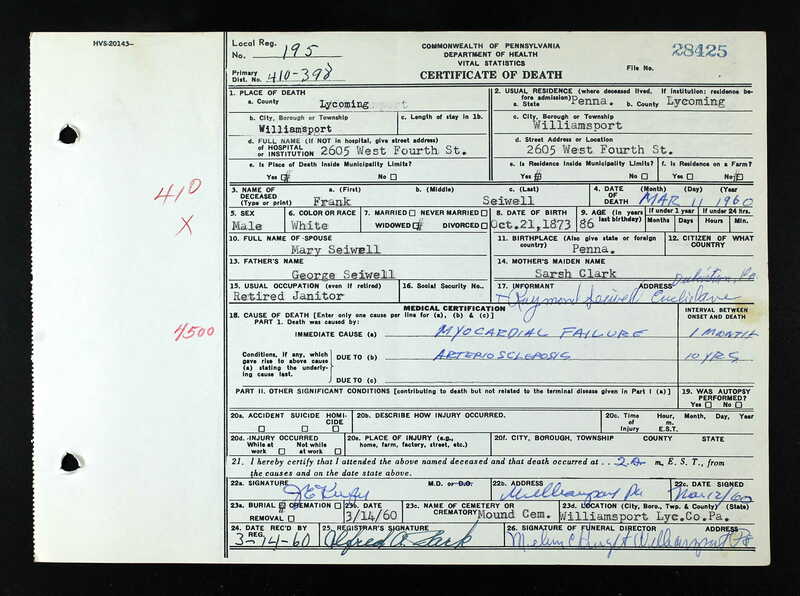 He worked with Philadelphia and Reading Coal and Iron Company in 1942 in Pottsville, PA.
Odillian married Eva Ann WATKINS [scrapbook], daughter of Benjamin WATKINS and Mary MINNINCH, about 1902 in PA. Eva was born on 6 Apr 1877 in Mount Carmel, Northumberland Co, PA. She died on 21 Jan 1963 in Shamokin State General Hospital, Coal Twp, Northumberland Co, PA. She was buried on 24 Jan 1963 in Mount Carmel Cemetery, Mount Carmel, Northumberland Co, PA.
Eva resided in 1910 in 12 Walnut St, Mount Carmel, Northumberland Co, PA. She resided in 1920 in Mount Carmel Twp, Northumberland Co, PA. She resided in 1930 in Mount Carmel Twp, Northumberland Co, PA. She worked as housework - at home in 1930. She resided in 1935 in Mount Carmel Twp, Northumberland Co, PA. She resided in 1940 in Mount Carmel Twp, Northumberland Co, PA. She resided in 1942 in RD 3 Reliance (Mount Carmel), Northumberland Co, PA. She resided in Jan 1963 in Reliance, Mt Carmel Twp, Northumberland Co, PA. She worked as housewife in Jan 1963. The cause of her death was injuries sustained in kitchen fall. + 3892 F i Mildred Eva BUCK was born on 7 Nov 1905. She died on 30 Oct 1986. Raymond Walter BUCK [scrapbook] was born on 14 Dec 1908 in Mount Carmel, Northumberland Co, PA. He died on 4 Jul 1994. He was buried in Mount Carmel Cemetery, Mount Carmel, Northumberland Co, PA.
Raymond resided in 1910 in 12 Walnut St, Mount Carmel, Northumberland Co, PA. He resided in 1920 in Mount Carmel Twp, Northumberland Co, PA. He resided in 1930 in Mount Carmel Twp, Northumberland Co, PA. He worked as laborer - coal breaker in 1930. He resided in 1935 in Mount Carmel Twp, Northumberland Co, PA. 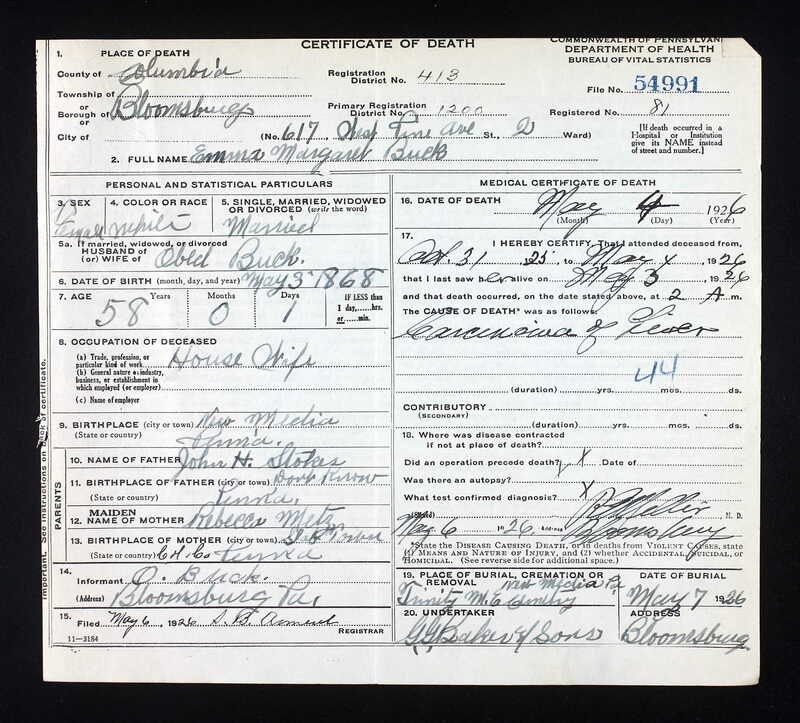 He resided in 1940 in Mount Carmel Twp, Northumberland Co, PA.
+ 3894 F iii Mary L BUCK was born on 13 May 1910. She died on 16 Jun 1973. 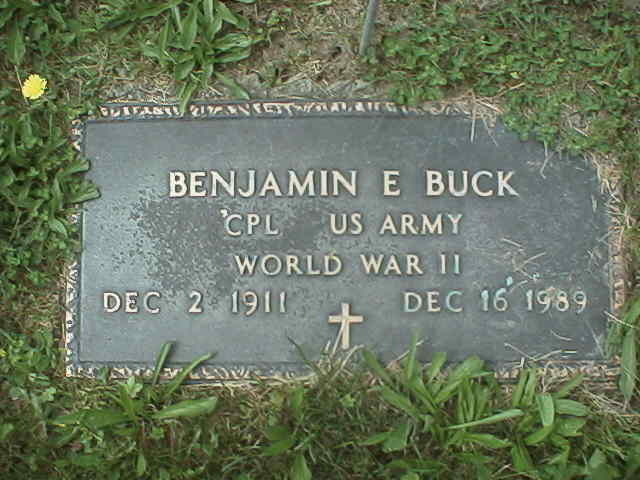 Benjamin Edgar BUCK [scrapbook] was born on 2 Dec 1911. He died on 16 Dec 1989. He was buried in Mount Carmel Cemetery, Mount Carmel, Northumberland Co, PA.
Benjamin resided in 1920 in Mount Carmel Twp, Northumberland Co, PA. He resided in 1930 in Mount Carmel Twp, Northumberland Co, PA. He worked as laborer - coal breaker in 1930. He resided in 1935 in Mount Carmel Twp, Northumberland Co, PA. He resided in 1940 in Mount Carmel Twp, Northumberland Co, PA. He served in the military with U. S. Army - Corporal in WW II. + 3896 M v Carl W BUCK was born on 5 Mar 1915. He died on 24 May 2004. 3897 M vi William BUCK. 1305. Benjamin A BUCK 1 (Lovina WILLIAMS , Tamsa BITLER , John Wolf , John , Johannes ) was born on 1 Apr 1879 in Bear Gap, Northumberland Co, PA.
Benjamin resided in 1900 in E 3rd St, Mt Carmel, Northumberland Co, PA. He resided in Jun 1923 in Sayre, Bradford Co, PA. He resided in 1930 in 602 Elmer Ave, Sayre, Bradford Co, PA. He worked as piper fitter - steam rail???? in 1930. Benjamin married Elizabeth M WOLFGANG "Lizzie" 1, 2, daughter of Jesse WOLFGANG and Sarah Elizabeth STEITZER, on 23 Nov 1901 in Schuylkill Co, PA. Lizzie was born on 19 May 1883 in Ashland, Schuylkill Co, PA. She died in 1961 in Northumberland Co, PA.
Lizzie resided in 1900 in Ashland, Schuylkill Co, PA.
+ 3898 F i Mary Esther BUCK was born on 30 Jun 1901. She died on 29 Jan 1949. 3899 F ii Christina BUCK. Benjamin also married Zena. Zena was born about 1880 in PA.
Zena resided in 1930 in 602 Elmer Ave, Sayre, Bradford Co, PA.
1310. Ida M WILLIAMS 1 (John Q WILLIAMS , Tamsa BITLER , John Wolf , John , Johannes ) was born in Oct 1876 in PA.
She was also know as Adda. She resided in 1880 in Coal Twp, Northumberland Co, PA. She resided in 1900 in 56 Seventh St, Sunbury, Northumberland Co, PA. She resided in 1910 in 56 Seventh St, Sunbury, Northumberland Co, PA. She resided in 1920 in 1022 Chestnut St, Sunbury, Northumberland Co, PA. She resided in 1930 in 138 5th St, Sunbury, Northumberland Co, PA. She worked as Seamer - Shirt Co in 1930. Ida married Charles A SHIPE 1, son of William SHIPE and Mary Elizabeth KEEFER, in 1895 in Northumberland Co, PA. Charles was born in Sep 1867 in Upper Augusta Twp, Northumberland Co, PA.
Charles resided in 1900 in 56 Seventh St, Sunbury, Northumberland Co, PA. He worked as Insurance Agent in 1900. He resided in 1910 in 56 Seventh St, Sunbury, Northumberland Co, PA. He worked as Insurance Agent in 1910. He resided in 1920 in 1022 Chestnut St, Sunbury, Northumberland Co, PA. He worked as Insurance Agent in 1920. He resided in 1930 in 138 5th St, Sunbury, Northumberland Co, PA. He worked as Collector - Insurance Co in 1930. Beatrice M SHIPE was born in Sep 1896 in PA.
Beatrice resided in 1900 in 56 Seventh St, Sunbury, Northumberland Co, PA. She resided in 1910 in 56 Seventh St, Sunbury, Northumberland Co, PA. She resided in 1920 in 1022 Chestnut St, Sunbury, Northumberland Co, PA. She worked as Office Clerk - Silk Mill in 1920. Lillian I SHIPE was born in Mar 1898 in PA.
Lillian resided in 1900 in 56 Seventh St, Sunbury, Northumberland Co, PA. She resided in 1910 in 56 Seventh St, Sunbury, Northumberland Co, PA. She resided in 1920 in 1022 Chestnut St, Sunbury, Northumberland Co, PA. She worked as Stenographer - Silk Mill in 1920. SHIPE was born in 1900/1910. SHIPE died in 1900/1910. Charles B SHIPE was born about 1905 in PA.
Charles resided in 1910 in 56 Seventh St, Sunbury, Northumberland Co, PA. He resided in 1920 in 1022 Chestnut St, Sunbury, Northumberland Co, PA. He resided in 1930 in 138 5th St, Sunbury, Northumberland Co, PA. He worked as Clerk - Railroad in 1930. + 3904 F v Florence E SHIPE was born about 1909. She died on 3 Dec 2001. 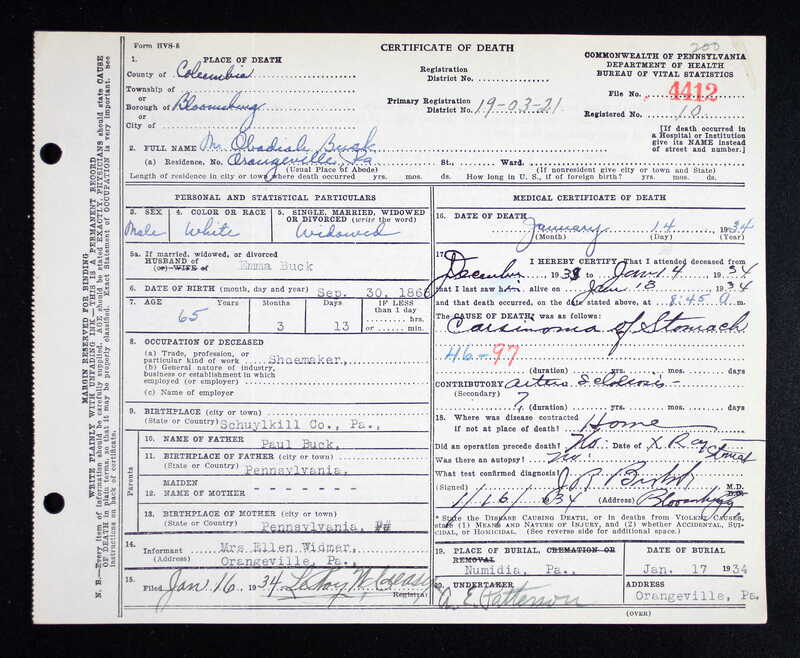 + 3905 F vi Ruth Lorraine SHIPE was born on 4 Jan 1912. She died on 25 Dec 2008. 3906 F vii Martha P SHIPE. 1312. Tamora Catherine WILLIAMS [scrapbook] (Erastus F WILLIAMS , Tamsa BITLER , John Wolf , John , Johannes ) was born on 6 Sep 1876 in East Union Twp, Schuylkill Co, PA. She died on 20 May 1918 in Ralpho Twp, Northumberland Co, PA. She was buried on 23 May 1918 in St Peters Reformed Cemetery, Paxinos, Ralpho Twp, Northumberland Co, PA.
Tamora resided in 1900 in Ralpho Twp, Northumberland Co, PA. She resided in 1910 in Ralpho Twp, Northumberland Co, PA.
Tamora married John Bailey SMITH [scrapbook], son of William SMITH and Angelina ADAMS "Mary", about 1892. John was born on 1 Mar 1871 in Locust Twp, Columbia Co, PA. He died on 30 Jan 1936 in Ralpho Twp, Northumberland Co, PA. He was buried on 3 Feb 1936 in St Peters (Blue Church) Reformed Cemetery, Paxinos, Ralpho Twp, Northumberland Co, PA.
John resided in 1900 in Ralpho Twp, Northumberland Co, PA. He resided in 1910 in Ralpho Twp, Northumberland Co, PA. He worked as Wood Cutter - Wworking Out in 1910. He resided in 1920 in Ralpho Twp, Northumberland Co, PA. He worked as Farmer - General Farm in 1920. + 3907 M i Jacob LeRoy "Roy" SMITH was born on 29 Apr 1895. He died on 27 Dec 1971. 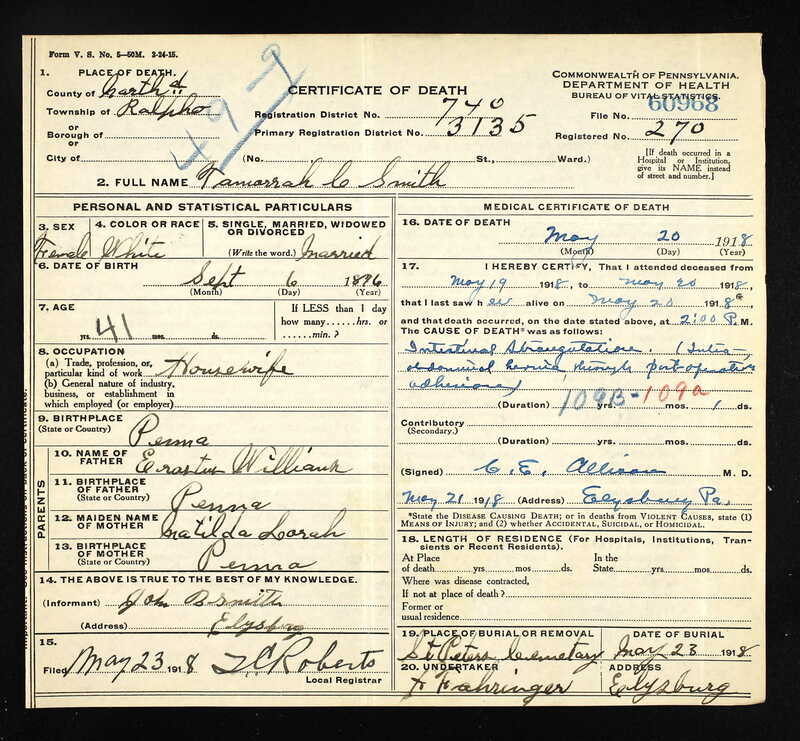 + 3908 F ii Bertha Elizabeth SMITH was born on 4 Jan 1899. She died on 26 Jul 1932. Margaret Pearl SMITH [scrapbook] was born on 7 Jan 1903 in Elysburg, Northumberland Co, PA. She died on 3 Jun 1912 in Elysburg, Northumberland Co, PA. She was buried on 7 Jun 1912 in St Peters Reformed Cemetery, Paxinos, Ralpho Twp, Northumberland Co, PA.
Margaret resided in 1910 in Ralpho Twp, Northumberland Co, PA.
Thomas Myrle SMITH [scrapbook] was born on 14 Aug 1909 in Elysburg, Ralpho Twp, Northumberland Co, PA. He died on 20 Sep 1909 in Elysburg, Ralpho Twp, Northumberland Co, PA. He was buried on 22 Sep 1909 in St Peters Reformed Cemetery, Paxinos, Ralpho Twp, Northumberland Co, PA.
+ 3911 M v Henry William SMITH was born on 13 Aug 1911. He died on 5 Dec 1982.